Testing the water by the amount of artificial sweetener. Interesting that they don't talk about additional fc oxidizing and getting rid of most or even all of these. I always said if you smell it the pool needs more fc! A perfect reason to own our own pool!!! I just heard this on the radio this afternoon on NPR. I heard that they might be making a kit that the public can purchase, or did I not hear correctly. One can buy a kit to detect creatinine levels but I doubt you'd be able to measure single individual instances in a large pool volume. Like ammonia, by the time you're able to measure any significant quantity, it's waaaaaay too late, your FC is zero and your water probably stinks really bad. I've been reading these articles about pee in the pool and a lot of them only talk about the immediate chemical reaction. Is it just me or does the chlorine not break down the urine / urea and remove it from the water column? The urea does not remain in your pool forever. 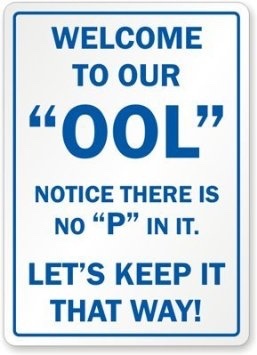 I heard someone in a TV interview say the only way to remove old pee from your pool was to drain it and refill it. The chlorine and uv from the sun will break it down. 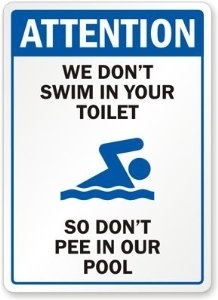 But urine takes a lot of chlorine to break down so that's why we tend to say urine eats chlorine. If it were true that the only way to remove urine was to drain then there would be little water left on earth. The dinosaurs were here for 165 million years. They were peeing the entire time(I assure you I have video) so every glass of water we consume is composed in a significant part of water that was dinosaur urine. With his knowledge of pools and chemistry he should get a job in a pool store. It's not only urine, it will be broke down, it's what is in urine, chlorine will not break down certain things that we pass in pee. Look at some studies, it's shocking what is found in perfectly kept and properly chlorinated pools. Or it's a good weapon in your arsenal if you've overdosed your pool with chlorine!